Corrugations - The things they do to you. A couple of hints for "first time" visitors to some of our country roads. Corrugations are the invention of a particularly fiendish devil and here are a couple of his favourite tricks. Aluminium cans will abrade through in just a few miles and leave all your beer sloshing about in the bottom of your fridge if you don't wrap them up. Sharp knives won't cut butter - supposing you have any left that wasn't spoiled by the beer - once again wrap them. Screw tops will be undone and the contents of jar and bottle mixed in an unholy cocktail - green tomato pickle and Dettol is one that lingers in my memory. Worthwhile spending a few minutes to put a bit of tape on them and it might save you from a life-long aversion to what had been some of your favourite things. Anything fastened with bolt and nut is fair game-a dab of nail polish helps or at least gives you a clue to what goes where, if you are cunning and use different colours. Don't get me wrong, corrugations have their uses; they deter lots of people from visiting my favourite places and keep outback mechanics flat out for a good part of the year! Comments for Corrugations - The things they do to you. Green tomato pickle and Dettol? Loverly indeed! I still fondly (not!) remember the trip with a litre of normal milk and a litre of soy milk all through the back of the car. Milk cartons are NOT unbreakable :-). Thanks for those great tips and the laugh. Excellent little article! Ha Ha have you ever rode on corrogations on a bike? It hurts! No I haven't, and no thanks, I think I'll give that one a miss :-). When driving over corrugations, and after you let your tyres down by 10 lb, should you use 4wd? Always use High Range 4WD on dirt roads where ever possible. It allows you to steer and control better and not push your car off the road. If you have drive at the front, you can help pull the car where you want it, not push it as you would with just RWD only. Keep to a speed you can control in case something goes wrong. A 4WD is easier and allows you to drive fast with less shaking. 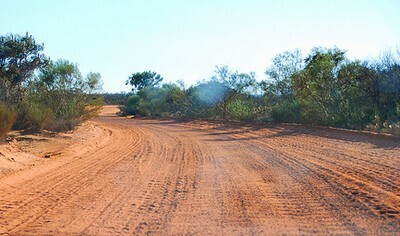 We did the entire Great Central Road once and some parts are really undoable without a 4wd. I have heard somewhere that gas bottles should be checked regularly in order to avoid popping. There are a number of things to consider when travelling with gas bottles. The first one however is always travel with it upright. Good to google the rest I reckon!! !